How sweet it is! 21 in a row! 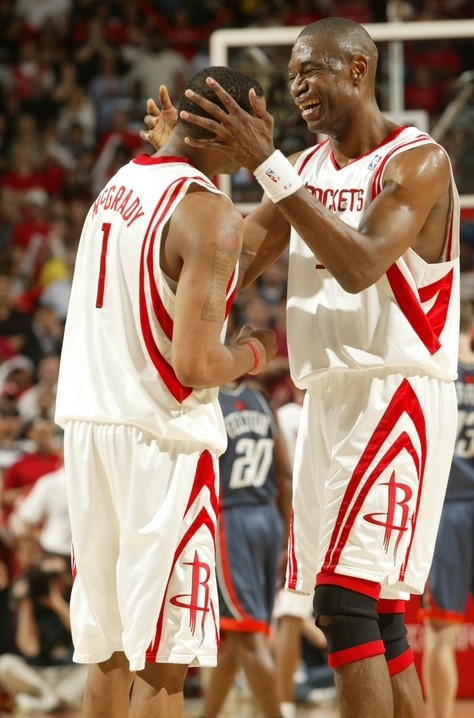 The elder statesman of the Rockets, Dikembe Mutombo, hugs Tracy McGrady after a historic game that gave the Rockets the 2nd-longest win streak in NBA history. Unfathomable. 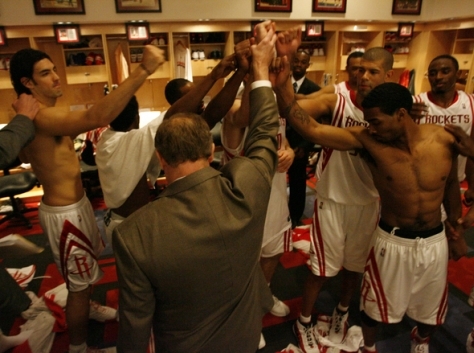 Below, coach Rick Adelman joins his players in a moment of solidarity. I just can’t get over what is going on with the Rockets. It’s hard for me to go to sleep, yet I know the amount of time it would take for me to write everything I’m thinking would not be good for my health, especially since I have to leave for the airport in the morning. So I hope to post more of my thoughts by late Saturday night after a long day of flying to the West Coast. Because it’s hard for me to get to bed, I have done something unprecedented to commemorate this momentous occasion. As time-consuming as it is to do after a game, I have uploaded some of the national TV coverage from ESPN talking about the Rockets’ winning streak. Please go to the bottom of this post to see those videos (you might have to click on the “Read the rest of this entry” link). I think you’ll really like them. Never in our lifetime could we see again what we have seen these past several weeks. The Charlotte Bobcats gave everything they had Friday night to keep the Rockets from making history, a quest to become the 2nd-longest winning streak in league history — 21 in a row. The fact Houston had to scratch and claw to get an 89-80 win makes getting the record that much sweeter. The players and fans had to sweat out every possession, the players had to overcome a 13-point deficit in the second quarter (their largest deficit during the streak), they overcame poor shooting from the field (40.9%) and very bad free throw shooting (57%), and they faced very underrated superstars in Jason Richardson (28 points) and Emeka Okafor (23 points) who wanted to show they can beat the best. But Tracy McGrady put on an amazing display of determination and stamina, playing all 48 minutes to score 30 points on 12-of-25 shooting, 7 rebounds, and 4 assists. Without him, the Rockets lose this game. Plain and simple. There were other players who stepped up, who I hope to write about on my next post to give them justice. But first and foremost, McGrady is playing like Dwyane Wade in the NBA Finals two years ago. It’s such a beautiful thing to witness. A guy who has been much maligned in his career is proving to his critics what he’s made of. I’ve never seen a more determined McGrady in my life. His finest moments have come during this streak. Rocket fans will never forget this streak, which may come to an end Sunday against the hyped up Lakers, even without Pau Gasol in the lineup because of a sprained ankle from Friday night. Kobe is playing out of his mind, as always. It’s going to be an awesome match-up. A game for the ages. But a few more thoughts about this historic streak. I am ecstatic the Rockets took care of business and won every game they could have been expected to win before these next 5 games they play against playoff contenders. I don’t think Rocket fans have felt this good since the Rockets went up 2-0 against Dallas in that playoff series 3 seasons ago. We all know how that turned out. But regardless of what happens this season with the Rockets, they have shown more determination in winning the last 9 games without Yao Ming than I have seen from a Rockets team since 1995. This game felt like a playoff atmosphere from the beginning. The stands were full and all the fans were into it. If it could only be like that all the time when the Rockets aren’t on big winning streaks. “It’s insane. If you have coached in the league like I have, if you have played in the league like Mash (fellow commentator Jamal Mashburn) has at a high level, you know how difficult it is to win ONE game in this league. You’re playing against great players, great coaching, you’re in difficult buildings. So this is just an unbelievable stretch that the Houston Rockets are showing us right now. “Great defense. Leading the league over this period of time. Allowing about 40% field goal shooting, keeps them in games when shots aren’t going in. “They’re able to play from in front at an unprecedented level so they’re almost never behind. More to come about this win before the Rockets play the Lakers on Sunday. This entry was posted on Saturday, March 15th, 2008 at 3:07 am	and is filed under vs. Charlotte. You can follow any responses to this entry through the RSS 2.0 feed. Awesome writing!! Fans like me can’t say enough at your great work! This Rocket is unbelievable! I THINK THIS YEAR IS THE YEAR OF THE STREAK!!! NEW ENGLAND PATRIOTS…18 STRAIGHT AND ROCKETS 21 AND COUNTING!!! I HOPE THE ROCKETS DON’T END UP LIKE THE PATRIOTS LOSING THE CHAMPIONSHIP GAME (SUPER BOWL)!!! I WAS WONDERING…SINCE YAO MING IS RECOVERING FROM HIS SURGERY AND IS RESTING HIS BODY AND HAS A LOT OF TIME NOW…DOES HE READ THE COMMENTS POSTED HERE?…OR DOES HE KNOW HE HAVE THIS PAGE IN HIS HONOR??? This is definitely starting to look like a team of destiny. You not only have to love that the team is winning, but how they are winning — and who they are winning with. They’re just a great bunch of guys, and this is such a fun team to watch. Even the ugly games. As you said John, all of this definitely evokes the Clutch City days. TMac definitely has to be given MVP consideration now. He’s really matured into a true leader of a championship-caliber team, making this team better in so many ways beyond just scoring — just as Hakeem finally matured into a champion back in the day. At some point, you have to wonder though when you give this guy some rest. Eventually, you have to wonder when the streak becomes less important than the playoffs. (OK, maybe we might need 48 minutes for just one more game against the Lakers). Granted, they are playing for more than the streak, and looking to improve their seeding. But this is a long season. And the playoffs is a second, whole other season. The Spurs better than anyone understand the importance of pacing — and preserving their best for when it counts most. Speaking of the Spurs, I think their ability to play multiple styles of games is what sets them apart. (I hate praising them, because I’ve pretty much hated them since the DRobinson days. I still gloat over Dream’s clinic on him in 95. But I’ve always respected them). That’s where not having Yao will hurt them most. On the other hand, the loss of Yao has been a blessing in some ways for the team — and maybe for Yao in the long run. Multiple guys have had to step up, and in the process have blossomed into their roles. It may not have happened as quickly with Yao in the lineup. Back to Yao’s injury — maybe not being stuck in the day-to-day grind of playing will make it easier for Yao to step back and see how TMac has grown into a championship-caliber player. Maybe somehow this will help Yao learn those intangibles which are so hard to learn — let alone articulate — even for the most talented and smartest players. Either way, the feeling is great. Just trying to live in the moment, enjoy what they’re doing now — with the knowledge that (bar injury — knock on wood), when Yao is back, this team is on the verge of extended greatness. John, also forgot to say (I know, I know — how could I have left something out in that long, marathon, rambling comment): it’s not just a long season for the Rockets, it’s a long one for you. So get some rest. Just a hunch, but I have a feeling there will be a lot more to get excited about, and a lot more reasons to be staying up over the next few months. I’ve been putting in too many late nights and all-nighters myself for work — it takes its toll. Then again, this might be a once-in-a-lifetime experience. But then again, it might not — if you hang around long enough. Not to sound morbid or anything. Sh*t, maybe I’m going delirious and incoherent from lack of sleep. I am glad you said Yao might be reading this blog. I hope he realizes that he played a big part in this streak. Understandably, he would be a bit down not having been part of this now, but he had done a lot of hard work and making this possible early in the streak. So, he should be very proud of himself and of his team-mates. I would like to wish him speedy recovery and that we are thinking of him.